Many competing telecomm technologies have been developed. Each telecommunication technology has advantages and limitations, it is often difficult to determine which systems offer the best solutions for specific applications. This blog provides unbiased source of information on telecommunications technologies and guide on which provides a big picture of telecommunication technologies along with their features, costs, and services that make them very desirable to implement. Unified communications offers a measurable benefit for companies by value-enhancing usage to allow easy communication combined with simultaneous exchange of information among users in their daily communication. To further explain the term unified communications (UC) at this point, the word unified means to bring everything together in real-time communication (RTC). In contrast to unified messaging (integration of telephony, fax, and voicemail), the idea behind unified communications is a merger of all available communications services, especially instant messaging systems (which are the integration with presence features) to facilitate the accessibility of communication partners. The further integration of this technology in our work and business processes is an important focus and also an increasingly frequent request to the technology vendors and manufacturers. Unified communications can be understood as an extension of unified messaging because unified messaging refers to the integration of messages in an application and is in fact a form of asynchronous communication. Unified communications takes this a step further to create real-time communication as it aims to integrate synchronous communication media together. Also note that the possibilities of unified communication from the portal and social networking platform technologies have also increased. 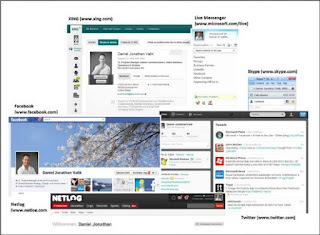 You will certainly have heard of Google+, Netlog, SkyDrive, Facebook, Twitter, LinkedIn, XING, and other platforms. These platforms allow not only the exchange of personal and business-related information, but also the integration and availability of further real time communication and collaboration add-ons like instant messaging, document-sharing, Internet telephony and even integration with line of business applications. We do not only focus on the way information within the companies is changing but also we have to keep an eye on how the consumer environment is changing. The integration of such services has shifted from a pure consumer to a business or consumer/business mixed variant and very often, communication with business and private contacts overlap. Let's take a look at Facebook. Facebook created at first a social networking platform to give people the opportunity to get connected, exchange content like pictures, personal information, friend lists, and more. Several years later, Facebook created a new platform inside the original Facebook application with the name Branchout. Branchout's idea was derived from Facebook. Branchout sets out to provide similar features to Facebook but for business. The idea is comparable to other social networks like Linkedin or XING where people get connected, create business, or find jobs and career opportunities. With Branchout, Facebook went into a more business related and focused area—integrated in the private social network. Social networks offer an important platform for product information and sales. International studies have shown that in the future, more products and services through social networks and platforms can be distributed and rated, just like departmental stores or shops. The technology allows us to communicate with "friends" and contacts about the quality of the product and to write a review providing information on the product. This is only one example of social networks. Another good example is product marketing. How companies provide information about their services and products changed completely with the development of social networks. Facebook, Twitter, LinkedIn, Amazon, Google, Microsoft, and other companies changed how customers receive information when shopping for products and services. The technology trend is clear: this change will continue. Online shops, marketing, and access to products and service information through social networks will be the standard for the new generation of end users and buyers. Other trends include increased networking with business applications for companies. Many manufacturers and software companies also increasingly offer their solutions to integrate and coexist with social platforms. For example, Microsoft, Cisco, and IBM offer networking with Facebook and other social networks in its collaboration solutions. They are simplified to integrate communication, information, and contact databases. It will be no surprise that solutions available on the desktop and office computers will also be further extended to mobile devices such as tablets in the near future.